Bilsing Automation, Clinton Township, MI, has announced its new 3D press-line scanning service, aimed at helping metalformers accurately simulate their stamping processes. The service promises to help suppliers meet automotive-OEM demands to have press lines up and running quickly, following tooling and die installation. As press lines lack accurate 3D data, either because the line has been modified over time or because the data for older lines exists only in 2D drawings, Bilsing Automation will send a team and equipment to the customer facility where a scan can be performed over a weekend. Thus, the service can be completed without impacting production. Static accuracy of the data is +1 to 3 mm; dynamic accuracy is +1 mm. Once the data has been collected, a digital model of the line is created within three days. 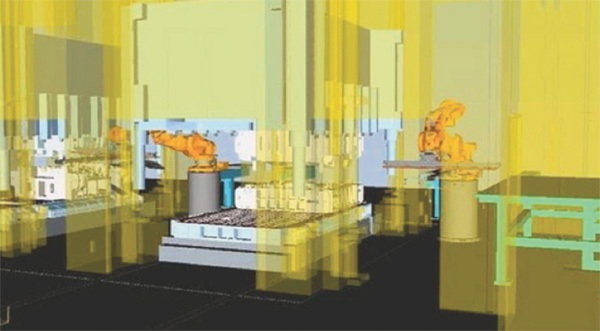 From there, various production scenarios of the automation process can be created in two to four weeks. All press and robot motions are simulated to ensure that no collisions occur and that throughput requirements can be met. This helps eliminate re-tooling during the build phase, minimizing system launch time. The simulation, which helps to verify the stroke rate of the press line on specific die sets, is translated in an offline program to be set up on the press line’s HMI.